Do you suffer from lower back pain? 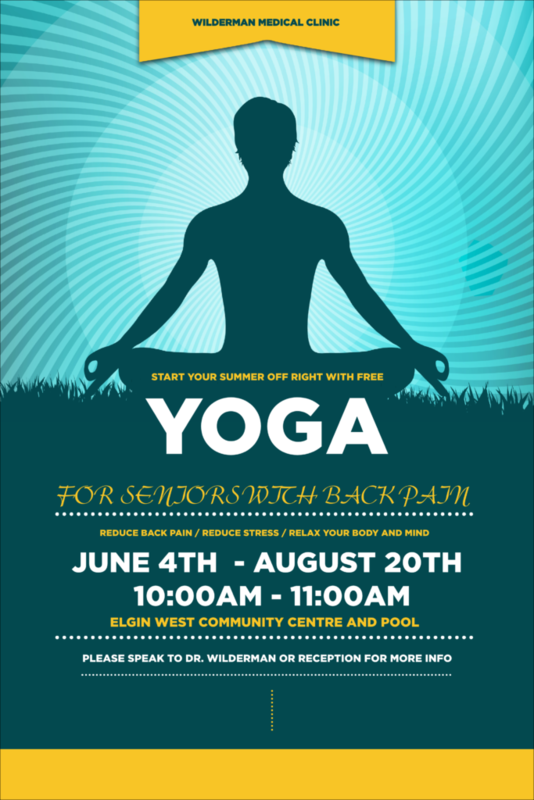 Wilderman Medical Clinic is offering free yoga session for seniors with lower back pain. This is part of a study that we are conducting to see whether yoga can help reduce chronic lower back pain in our patients. Based on previous studies, yoga can help reduce back pain, improve back function, reduce stress, and improve their overall quality of life. The classes will be run by a professional yoga instructor, and will be offered on a weekly basis for 11 consecutive weeks, starting June 4th. There are two ways to sign up. If you have an appointment with Dr Wilderman this month, simply let him know that you would like to sign up for the yoga study. You can also stop by the clinic and see Luke in room 202, or reach him by telephone at 905-886-1212 extension 202. Where do the yoga classes take place? The classes will take place at the Elgin West Community Centre and Pool, 11099 Bathurst St., Richmond Hill. It is about 15 minutes away from the clinic, north of Bathurst St. and Elgin Mills Rd. The community centre is fully accessible. What benefits can I gain from participating in this study? Previous studies have shown that yoga can decrease back pain, increase back function and , and relieve stress by relaxing the body and mind. Due to these improvements, some people are able to increase their overall quality of life as a result of participating in yoga class.